We are excited to announce the 2018 Golden Grants award recipients. We received many, many applications from very awesome and worthy organizations. If you did not receive a grant in the program’s inaugural year, you are welcome to try again later this year. Please check this site for 2019 Golden Grants information in July. One application per program/initiative/organization will be accepted. This program is limited to activities benefitting K-12 students in the following counties: Barrow, Bartow, Butts, Carroll, Cherokee, Clayton, Cobb, Coweta, Dawson, DeKalb, Douglas, Fayette, Forsyth, Fulton, Gwinnett, Hall, Haralson, Heard, Henry, Jasper, Lamar, Meriwether, Morgan, Newton, Paulding, Pickens, Pike, Rockdale, Spalding and Walton. Golden Grants begins at 12:00:01am Eastern Time (“ET”) on September 24, 2018 and ends at 11:59:59pm ET on November 2, 2018 (the “Program Period”). Only completed applications with itemized budgets will be considered. Employees of Greater Atlanta McDonald’s Owner’s Association (the “Sponsor”), and each of its respective parents, subsidiaries, affiliates, franchisees and related companies and their respective advertising and promotion agencies, consultants and agents, as well as immediate family members and/or those living in the same household of each such person, and any others engaged in the development, production, execution or distribution of this program (hereinafter the “Program Entities”) are not eligible to participate. “Immediate family member” shall be deemed to mean husband, wife, children, mother, father, sister, sister in-law, brother or brother in-law. 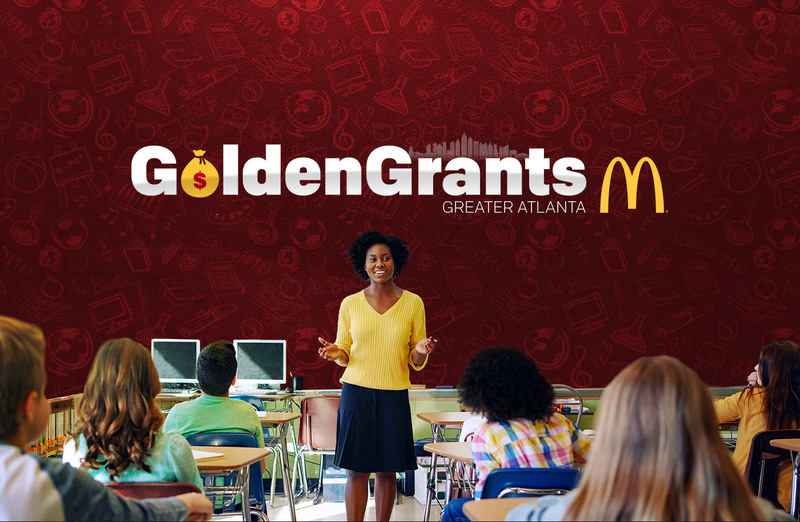 To enter, Entrant must visit www.GoldenGrantsATL.com (the “Online Website”) during the Program Period and complete the Online Program entry form in its entirety including: complete name, email address, phone number and project details. Then, click the “Continue” button to receive one (1) entry into the Program. All online entries must be received by 11:59:59pm ET on November 2, 2018. There is a limit of one entry per Entrant for the entire Program Period. Any attempt by an Entrant to obtain more than the stated number of entries by using multiple/different identities, and/or any other methods will void that Entrant’s entry and that Entrant may be disqualified from the Program. Entries submitted by anyone other than the Entrant are void. In case of dispute as to the identity of any Entrant, entry will be declared made by the registered name and address on such entry. Any potential grant winner may be requested to provide Sponsor with proof that such person is the grant winner. Neither Sponsor nor any Program Entity is responsible for any entry that is late, illegible, incomplete, invalid, unintelligible, whether due to system errors, omissions, interruption, deletions, defects, delay in operations or transmissions, theft or destruction or failures, faulty transmissions or other telecommunications malfunctions, human error, entries not received resulting from any hardware or software failures of any kind, lost or unavailable network connections, failed, incomplete or garbled computer transmissions, typographical or system errors and failures, faulty transmissions, technical malfunctions, or otherwise. Only fully completed entries are eligible. Proof of submission will not be deemed to be proof of receipt by Sponsor or Program Entity. On or about November 30, 2018, potential grant recipients will be selected from all eligible entries received by the Sponsor Representative. By entering the Program, Entrants fully and unconditionally agree to be bound by these Official Rules and the decisions of the Sponsor and Program Entities, which will be final and binding in all matters relating to the Program. To be eligible to receive a grant, all Entrants must have provided all submission information when prompted at the time of entry. Grants will awarded based on creativity, innovation and community impact on application of project/s. GRAND PRIZE GRANT: One (1) grand prize grant will be awarded, consisting of $20,000 (“Grand Prize”). Total approximate retail value (“ARV”) of Grand Prize is $20,000. FIRST PRIZE GRANT: One (1) first prize grant will be awarded, consisting of $10,000 (“First Prize”). Total approximate retail value (“ARV”) of Grand Prize is $10,000. SECOND PRIZE GRANTS: Ten (10) second prize grants will be awarded, each consisting of $1,000 (each “Second Prize”). Total ARV of all First Prizes is $10,000. Total ARV of all grants prizes to be awarded is $40,000. Limit of one (1) grant per person/household. All grants are non-transferable or assigned and no substitutions or cash redemptions. Program/initiative/organization must utilize grant within 12 months of receipt. No more than the stated number of grants set forth in these Official Rules will be awarded. Potential grant recipients consent to the use of his/her name, likeness, biographical information, and voice in advertising worldwide without additional compensation. GRANT RECIPIENTS: All Potential Grant recipients will be notified by phone on or about November 30, 2018 (the “Notification”). Grant recipients will be required to sign and return (except where prohibited) a notarized Affidavit of Eligibility and Liability/Publicity Release (the “Paperwork”) within seven (7) days of the Notification. By participating in this Program, Entrants and grant recipients agree to be bound by these Official Rules and the decisions of the Sponsor and Program Entities, which are final in all respects and not subject to appeal. Sponsor reserves the right to disqualify permanently from this Program any Entrant it believes has violated these Official Rules and verify eligibility of Entrants. Neither Sponsor nor anyone acting on its behalf will enter into any communications with any Entrant regarding this Program, except as expressly set forth in these Official Rules. By participating in this Program, Entrants, and grant recipients release the Sponsor and each and all of the Program Entities, from any and all liability, damages or causes of action (however named or described) with respect to or arising out of participation in the Program, and/or the receipt or use/misuse of any grant awarded, including, without limitation, liability for personal injury, death or property damage. Failure to comply with these Official Rules may result in disqualification from the Program. All Program materials are subject to verification and are void if (a) not obtained in accordance with these Official Rules and through legitimate channels, (b) any part is counterfeited, altered, defective, damaged, illegible, reproduced, tampered with, mutilated or irregular in any way, (c) are obtained where prohibited, or (d) they contain printing, typographical, mechanical, or other errors. Entrants assume all risk of loss, damage, destruction, delay or misdirection of Program materials submitted to Sponsor. In the event any portion of this Program is compromised by activities beyond the control of the Sponsor which, in the sole opinion of the Sponsor, corrupt or impair the administration, security, fairness or proper play of the Program or this Program, Sponsor reserves the right at its sole discretion to modify, suspend or terminate the Program. Winning a grant constitutes permission for Sponsor and its agencies to use grant recipients’ names, voices and/or likenesses for purposes of advertising, promotion and publicity, for this Program only, without further compensation, unless prohibited by law. Sponsor may prohibit an Entrant from participating in the Program or winning a grant if, in its sole discretion, it determines that said Entrant is attempting to undermine the legitimate operation of the Program by cheating, deception, or other unfair playing practices (including the use of automated quick entry programs) or intending to annoy, abuse, threaten or harass any other Entrants, Sponsor, or Program Entities. If for any reason this Program is not able to be conducted as planned, including, but not limited to, by reason of infection by computer virus, bugs, tampering, unauthorized intervention, fraud or any other causes beyond the reasonable control of Sponsor which corrupt or affect the administration, security, fairness, integrity or proper conduct of the Program, then Sponsor reserves the right at its sole discretion to cancel, terminate, modify or suspend the Program and randomly draw from those entries received up to the cancellation/suspension date to award grant. CAUTION: ANY ATTEMPT BY A PERSON TO DELIBERATELY DAMAGE OR UNDERMINE THE LEGITIMATE OPERATION OF THE PROGRAMS MAY BE IN VIOLATION OF CRIMINAL AND CIVIL LAWS AND SHOULD SUCH AN ATTEMPT BE MADE, SPONSOR RESERVES THE RIGHT TO SEEK REMEDIES AND DAMAGES (INCLUDING ATTORNEY’S FEES) FROM ANY SUCH PERSON TO THE FULLEST EXTENT OF THE LAW, INCLUDING CRIMINAL PROSECUTION. SPONSOR’S FAILURE TO ENFORCE ANY TERM OF THESE OFFICIAL RULES SHALL NOT CONSTITUTE A WAIVER OF THESE PROVISIONS. By participating, Entrants and grant recipients agree to release, discharge, indemnify and hold harmless the Sponsor, the Program Entities, and each of their respective officers, directors, employees, representatives and agents (collectively, the “Released Parties”) from and against any claims made by any Entrant, grant recipients, or any other third parties, related in any way to the operation of this Program as well as any other claims, damages or liability due to any injuries, damages or losses to any person (including death) or property of any kind resulting in whole or in part, directly or indirectly, from receipt, acceptance, possession, misuse or use of a grants or participation in any promotion related activity or participation in this Program. This Program shall not be published without the written permission of the Sponsor. Winners will be notified by phone on or about November 30, 2018. If selected, recipients might be asked to submit additional information. Not providing additional information could result in program disqualification.